Out of Water is a journey from the shore to the sea about what we pass from generation to generation in habits, half-remembered stories and strands of DNA. It is about mortality and survival, fragility and alchemy, swimming and singing. The audience begin a mile away from the performers at dawn or dusk and walk towards them into the sunrise/sunset, until they are united at the water’s edge. Throughout their journey the audience listen via headphones to a live radio transmission soundscape and score. ‘I’ll help you darling.’ My mother showed me how to float, taught me how to breathe. Sometimes she would join me and I would I watch her move underwater dancing in a secret world, infinitely light. She can’t make it down to the sea now. The last time I came here with her she made it half way, further back than we have come, and then she stopped and sat on the sand, exhausted, unable to catch her breath. I realize that without her now I can’t touch down. I am out of my depth, out of breath. Won’t someone help me; can’t you see I’m drowning? “We are on Portobello Beach, Edinburgh, at sunset. We walk west, as a pack, a herd, into the setting sun. The shipping forecast gives way to the dulcet tones of Helen Paris (half of the esteemed UK/USA company Curious, although in Out of Water she is collaborating with sculptor/ visual artist Caroline Wright). Helen’s seductive voice lures us siren-like to the sea. It’s a glorious evening, the sun a rich rusty red in the West, the sea a soft blue, the sky lilac streaked with deep indigo. The tide is out, the waves lap softly on the shore. The headphones feed us Helen’s poetic reflections on learning to swim; on the lack of lighthouses; on the behaviour of migrating geese, whose v-shaped formations increase their flying speed. A male voice continues with the lifesaving instructions. A beautiful violin line floats in (courtesy of composer Jocelyn Pook). “A poetic and musical meditation on how easily we can end up all at sea. It’s a wonderful melding of performance and landscape, the sky blushing silvery-pink as we wander across the beach towards the pewter ocean, which meets the shore like a line drawn in charcoal in a child’s wonky hand. 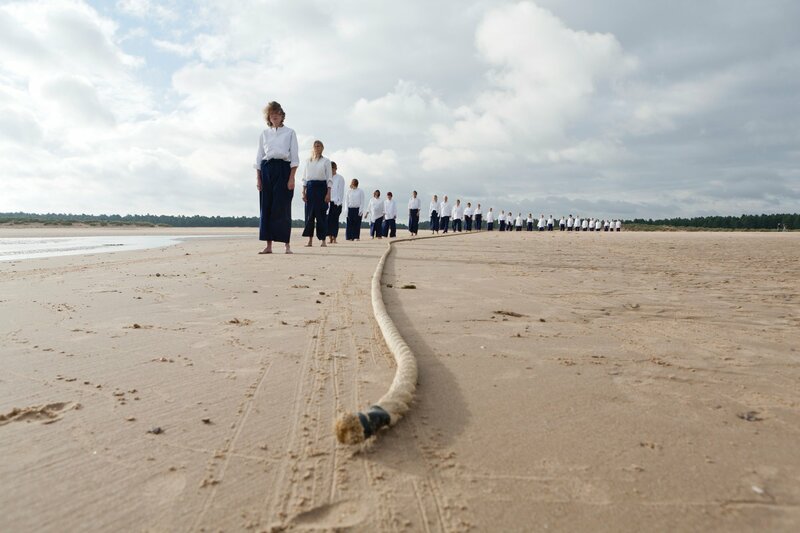 Awaiting us are a group of sailors in white shirts and royal-blue culottes, a rope at their feet. 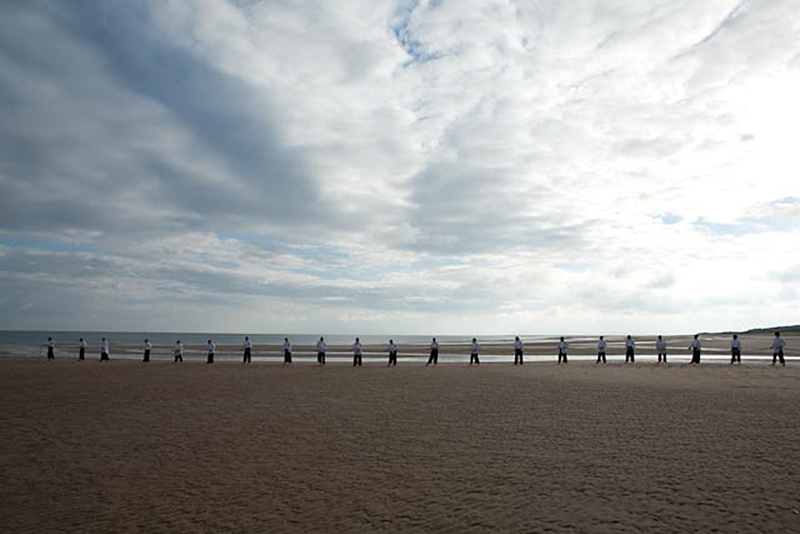 Created by Caroline Wright and Helen Paris, text set to music by Olivier Award winner and Golden Globe nominee Jocelyn Pook and sung by renowned soprano Laura Wright, Out of Water was first commissioned as part of the London 2012 Cultural Olympiad. 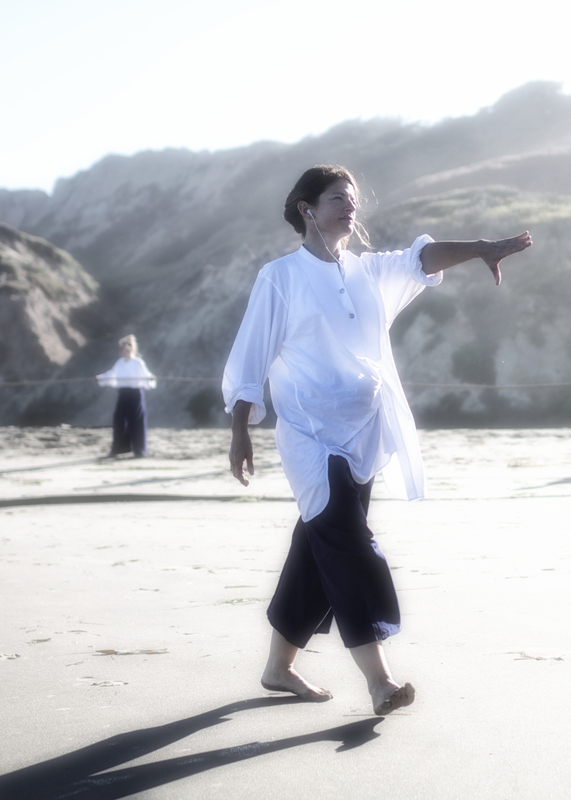 It has since travelled to beaches in California and Scotland as part of PSi19 and The Edinburgh International Festival, respectively. 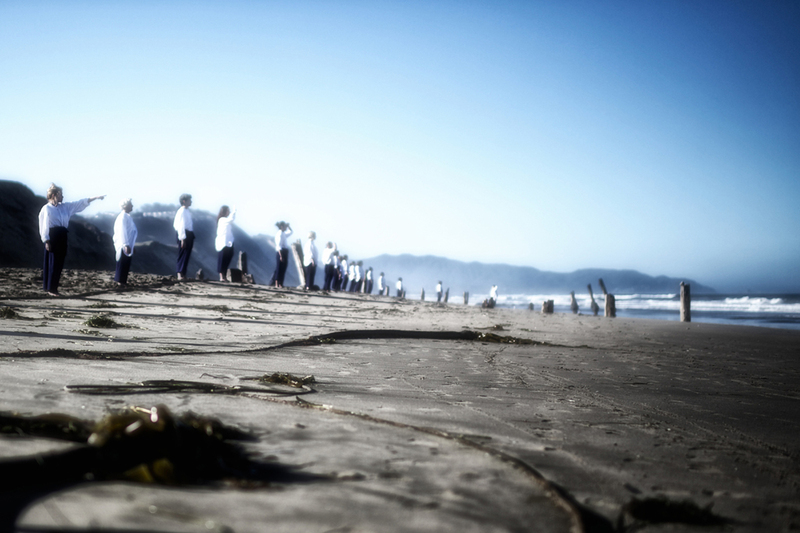 A cast of thirty performers, singers and swimmers is drawn from the local communities. Produced and managed by Artsadmin.